PT Stylish Ivory (#8) finishes a nose back in the fastest of 12 schooling races conducted Friday afternoon at Remington Park. OKLAHOMA CITY, OK�FEBRUARY 14, 2014�Pt Stylish Ivory finished a nose back in the fastest of 12 schooling races held Friday afternoon at Remington Park in Oklahoma City. The first of two days set aside for schooling races this week got underway around 11:30 a.m. and saw an alternating tail wind on-and-off most of the day Some 80 two-year-olds made their track debuts. Pt Stylish Ivory clocked the second fastest time of :13.33 seconds, an 84 speed index for the 250 yards. Kasey Willis conditions the IVORY JAMES filly for owner Tom Lepic. She is out of the Shazoom mare Signs Zoomer. For a complete list of horses by times who competed in Friday's trials CLICK HERE. 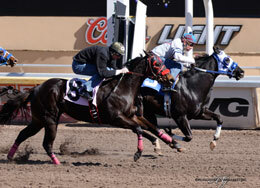 Videos of today's races can been found on the OQHRA website. Thirteen more schooling races for two-year-olds will be held on Saturday at Remington Park. Expected first post is 11:30 a.m. CLICK HERE for Saturday's race preview. Results and individual times for the schooling races can be found in StallioneSearch.com's Racing Section tomorrow (Saturday) as soon as they become available. The 2014 American Quarter Horse & Mixed-breed Season at Remington Park begins March 7 and continues thru June 1.